The luxury department store has benefited from soaring demand for caviar. Rolls-Royce isn’t the only luxury brand with good news to toast today. 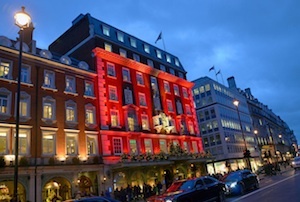 Iconic London department store Fortnum & Mason said its like-for-like sales were up 18.3% in the five weeks to January 4th compared with last year. This success was partly spurred by a 42% jump in caviar sales and a 21% increase in sales of Fortnum’s famous hampers, suggesting wealthy Londoners and tourists are more than happy to splash the cash again. While its flagship store on London’s Piccadilly enjoyed record sales (it’s not clear exactly how much), it was the company’s St Pancras International outlet, launched in 2013, which performed best, with sales up 47.7%. Fortnum’s didn’t participate in Black Friday or Cyber Monday, as would be expected, but its online sales still shot up by 30%. The news tops off a year of positive news for the 307-year-old retailer, which opened its first international store in Dubai in June. In November it reported annual profits of £3.8m, more than double the previous year, off the back of a 14% jump in sales. On December 22nd it experienced its biggest day of trading in ever. ‘This has been a very significant year for the company, and our excellent Christmas results are the reward for all the work we have done throughout the year making our brand more relevant and contemporary,’ said its chief executive Ewan Venters. He added that he was particularly pleased that much of the growth came from domestic sales. The company have just one overseas store, but if it proves to be popular then Fortnum & Mason could find the deep pockets of Asia hard to resist.